Looking across a grassy plain towards a horizon dotted with several hut roofs. 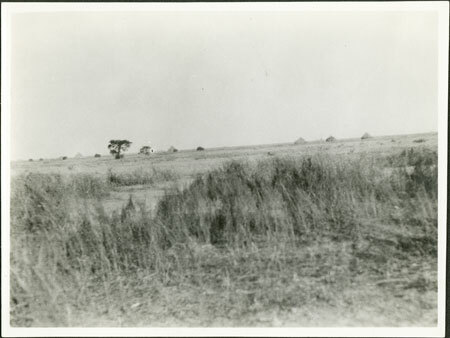 Evans-Pritchard took numerous photographs of this type to document the environments surrounding settlements, as well as the spacial distribution of homesteads in Nuer villages. Note on print reverse ms pencil - "31/7"
Morton, Chris. "Distribution of Nuer homesteads" Southern Sudan Project (in development). 03 Jan. 2006. Pitt Rivers Museum. <http://southernsudan.prm.ox.ac.uk/details/1998.346.337.2/>.